We’d love your help. Let us know what’s wrong with this preview of Nightrise by Anthony Horowitz. To ask other readers questions about Nightrise, please sign up. why is it in a series? Nightrise is the third book in The Power of Five series, written by Anthony Horowitz. It was published and released in the UK on 2 April 2007 by Walker Books Ltd. It is preceded by Evil Star, released in 2006, and followed by Necropolis, which was released on 30 October 2008. The title refers to a fictional organisation represented in the book. And also it refers to the Old Ones' presence on Earth, and their spreading darkness. The third in Horowitz's Power of Five series sees the action move to Nevada where Scott and Jamie Tyler perform a mind-reading act to bored casino audiences. Only their act is real and one night they are ambushed by two mysterious men who kidnap Scott and frame Jamie for murder. Jamie escapes with the help of Alicia McGuire, a former aide to Presidential nominee Senator John Trelawney who has been searching for her son, Danny. Together they discover that children all over the country have been d The third in Horowitz's Power of Five series sees the action move to Nevada where Scott and Jamie Tyler perform a mind-reading act to bored casino audiences. Only their act is real and one night they are ambushed by two mysterious men who kidnap Scott and frame Jamie for murder. Jamie escapes with the help of Alicia McGuire, a former aide to Presidential nominee Senator John Trelawney who has been searching for her son, Danny. Together they discover that children all over the country have been disappearing - children with strange abilities - and all roads lead back to the sinister Nightrise Corporation. To find Scott, Jamie must go undercover into a youth detention centre that's run by Nightrise. Doing so will place Jamie in terrible danger, danger that that will send him back 10,000 and put him in the middle of the first fight between the Gatekeepers and the Old Ones. This is a terrifically paced read, full of thrills, fights and perilous situations. Horowitz does well to convey Jamie's confusion at what is happening to him and his fear of his extraordinary ability and Jamie grows from being in need of his brother's protection to becoming his brother's protector. There's a strong political backdrop to events, with Trelawney's Presidential campaign likely to draw a wry smile from adults. Horowitz also throws in some scenes from the side of the Old Ones, helping to flesh out what is happening among their supporters. This book took me a little longer to read than planned. I blame this entirely on me struggling to get properly in to the story. Firstly, this book was the dullest of the series so far. I enjoyed "Ravens Gate" It had a sense of mystery to it, and I thought the story was intriguing. This however, had zero charm to it, the plot was slow and I could already anticipate exactly what was going to happen. The character development is tolerable, but not in the sense of actually getting excited by the entr This book took me a little longer to read than planned. I blame this entirely on me struggling to get properly in to the story. The character development is tolerable, but not in the sense of actually getting excited by the entrance of new characters. I'm a stickler for series. I love Darren Shan and the like and when I first opened Raven's Gate I was immediately drawn in, it was a good book. Evil Star was alright and with this: book three in the Gatekeepers saga dubbed Nightrise I wasn't too immersed. It's a young adult's fiction novel of two orphans abandoned in a tunnel near a Washoe native American reservation. Scott, the apparent protector of the two, and Jamie Tyler, the doubting protagonist, performing in a rundown play house in Reno, I'm a stickler for series. I love Darren Shan and the like and when I first opened Raven's Gate I was immediately drawn in, it was a good book. Evil Star was alright and with this: book three in the Gatekeepers saga dubbed Nightrise I wasn't too immersed. It's a young adult's fiction novel of two orphans abandoned in a tunnel near a Washoe native American reservation. Scott, the apparent protector of the two, and Jamie Tyler, the doubting protagonist, performing in a rundown play house in Reno, Nevada called... the Reno Playhouse. Why are they in this book, could they be two of the five? Well, yes. As members of the five it is there sworn duty to return the world to order when the Old Ones, the first ever evil, returned. The admittance by the main character of feeling inferior to his twin brother despite not knowing who was born first can only lead one to assume that this is going to be a coming of age novel meant to inspire our youth to "come into their own". It starts fairly slow with the characters; Jamie and Scott have the uncanny ability of reading each others thoughts. An assumed parlor trick they pull as part of their "Circus of the Mind" act. When two men arrive and abduct, or at least try to abduct, the boys from the play house. They succeed in taking Scott but Jamie is rescued by an Alicia McGuire. The subsequent storyline revolves around Jamie's quest to not only return to the side of his brother but rescue Daniel the abducted son of Alicia. Throughout the story it's revealed that Nightrise the multibillion dollar corporation is behind the abductions as they are working towards the rebirth of the old ones. Jamie is shot,you know how and why, and in his trauma induced stupor he is transported 10000 years into the past to take the place of his deceased ancestor in the first battle between the five and the old ones and it is truly an oasis of action to break up the tedium. Anthony Horowitz's THE GATEKEEPERS series continues with NIGHTRISE. The Old Ones are still a threat to the safety of the world, and the five young gatekeepers are the only ones equipped to help. Previously, Matt and Pedro were in Peru attempting to close the second gate. Their attempt failed and Matt was seriously injured. The adventure continues in a new location - Reno, Nevada. A small, rundown theater is hosting a performance called The Circus of the Mind. The featured act involves twins named Jamie and Scott. They amaze the audience by reading each others' minds. No one seems to know the secret of the trick. Actually, the secret is, there is no secret. They really do read minds and not just each others'. Readers will soon guess that Jamie and Scott are the next two of the special "five." The problem is how will they learn about their responsibilities and how will they find out about the others. When the evil corporation, Nightrise, becomes involved, it is clear that the Old Ones' power still reaches around the world. When Scott is kidnapped by Nightrise and taken to an isolated juvenile detention facility in the desert, Jamie begins his rescue attempt with the help of Alicia McGuire. She wants inside the prison as much as Jamie because she suspects her son has been kidnapped, as well. Nightrise seems to be making it a habit to kidnap teens with various "special" abilities. Could they be looking for the five young gatekeepers? So, this is the third book of one of my favorite series, The Gatekeepers!. When I finished reading Evil Star, I was a bit dissapointed, not with the story, but with some mistakes I found there. I started to think that maybe this book had an extraordinary plot like the others, but maybe it would contain some errors that would make me start disliking it. But fortunately, i'm glad to say that it didn't. This was super amazing!!! 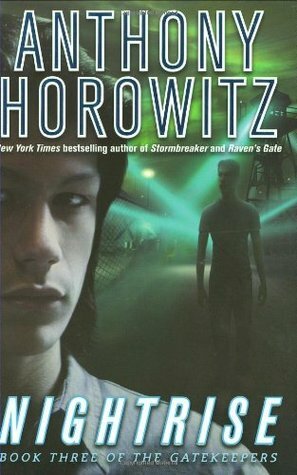 I was starting to compare this with Necropolis which is the most incre So, this is the third book of one of my favorite series, The Gatekeepers!. When I finished reading Evil Star, I was a bit dissapointed, not with the story, but with some mistakes I found there. I started to think that maybe this book had an extraordinary plot like the others, but maybe it would contain some errors that would make me start disliking it. But fortunately, i'm glad to say that it didn't. This was super amazing!!! I was starting to compare this with Necropolis which is the most incredible, fantastic, awesome, outstanding book in the series. In this third part of The Gatekeepers, you meet a new element of the 5, or better yet 2 of the 5, they are brothers. The storyline was good, and in this volume you get to see how a war, from a thousand years ago between the gatekeepers and the Old Ones, was held. so, the third book of "gatekeepers" , as i expect from each and every book Anthony Horowits writes, it was perfect, the story line, excitement and characters were all great, though being the first time i read from Jamie's perspective, it was a bit new and needed getting used to, but i liked it at the end. and just at the moment about page 250 that i was going to give up having any updates from Mat and Pedro's life, once again i felt satisfied with Horowits's great story telling technique, i can so, the third book of "gatekeepers" , as i expect from each and every book Anthony Horowits writes, it was perfect, the story line, excitement and characters were all great, though being the first time i read from Jamie's perspective, it was a bit new and needed getting used to, but i liked it at the end. and just at the moment about page 250 that i was going to give up having any updates from Mat and Pedro's life, once again i felt satisfied with Horowits's great story telling technique, i can now be sure to announce "He never lets you down"
Nightrise is book 3 in the series. This book took me a while to get into. But it got better after Jamie ends up 10,000 years back. I've always enjoyed Anthony Horowitz's books, and this is no exception. The power of five series I find to be, in my opinion, far greater than the Alex Rider series. The 1st power of five books, Raven's Gate and Evil Star were brilliant, and this one is no exception. Nightrise I found, starts off fairly slow, as it's the third installment I expected there to be more use of the five's 'powers', as they are no longer a mystery to the reader, but like before, the powers are rarely used. However, the s I've always enjoyed Anthony Horowitz's books, and this is no exception. However, the story was revived when the main character, Jamie, is transported back in time. Horowitz presented a fantastic battle scene, with just the sort of detail of the 'Old Ones' as I'd hoped for. This, for me, was truly epic, and well worth reading! I enjoyed reading about the character Jamie, but I feel he is slightly shadowed since the 1st two books are centered around the other character, Matt. I felt a longing throughout the book to know what was happening in Peru with Matt and Pedro, now that the second gate is over and the Old Ones have escaped. I am looking forward to the forth book, which I believe shall be called 'Necropolis: City Of The Dead' and mainly about the female character Scar. Hopefully, this time Horowitz will update the reader on what is happening with Matt, Pedro, and now, Jamie and Scott, as well as including lots about what the Old Ones are doing now that they are loose within our modern world. I liked this book but I kind of wish that he kept the same characters. Just kept the plot going with the two and then they find Jamie and Scott...somehow. 401 pages, it's a good book and the authors style is fantastic! This book, I couldn't put down. Although it's such a good book, it did get a bit confusing at times. I figured it out in the end. It was confusing that Jamie is Sapling, Scott's Flint, Pedro's Inti and so on. Jamie was dead, he comes back in another world where Sapling's dead. He replaces Sapling. This bit I understood. Scott is imprisoned by Nightrise, and Jamie and Alicia go to look for him. Alicia will only help Jamie if he brings 401 pages, it's a good book and the authors style is fantastic! Scott is imprisoned by Nightrise, and Jamie and Alicia go to look for him. Alicia will only help Jamie if he brings back Daniel, her son. It is just a bit confusing in places. That is the only negativity that's coming from this review. The book blew me away with the astonishing style. I got 401 pages of the author's style and I never got bored of it! My favourite character was Jamie, who happens to be the main character. My least favourite character would be Colton Banes. Banes is mean and kills his friends. Another thrilling read in this series! This time, this instalment diverges from Matt and introduces new characters and a story that's filled with adventure, deception, and magic. I liked how this story progressed alongside Matt's and delved more into the lore of the Five. It took them in a direction I didn't expect and I found myself unable to stop reading! Jamie and Scott have tragic backstories that made them some of my favourite characters. Though they're twins, they have wildly different per Another thrilling read in this series! This time, this instalment diverges from Matt and introduces new characters and a story that's filled with adventure, deception, and magic. I liked how this story progressed alongside Matt's and delved more into the lore of the Five. It took them in a direction I didn't expect and I found myself unable to stop reading! Jamie and Scott have tragic backstories that made them some of my favourite characters. Though they're twins, they have wildly different personalities. Jamie's personality is sympathetic and easy to relate to. I was always rooting for him and wanting him to escape to find his brother. I wasn’t sure how to feel about this book, I found it a little confusing. I second guessed myself thinking maybe I had read out of order. But I’d triple checked and held out, it does clarify itself later on! I personally found this a bit slower paced but I think it ends up adding more information about Raven’s Gate that’s helpful to bulk out the realms. This review has been hidden because it contains spoilers. To view it, click here. I think that it was a bit sad that Jaime had his brother being taken away. Scott went through a lot of pain with Nightrise Corporisation. اسم کتاب توی ترجمه طلوع تاریکی انتخاب شده. شاید از یه لحاظی بشه گفت انتخاب درستی بوده. داستان در مورد دو نگهبان دیگه ی دوازه به اسم های جیمی و اسکات تایلره که حالا با برگشت پیشینیان در خطرن. اونا ردگیری شدن و متیو و پدرو از اونا هیچ اطلاعی ندارن. پس اونا باید به تنهایی از خودشون مراقبت کنن تا مت و پدرو و نکسوس خودشون رو وارد ماجرا کنن. اما برای این دو برادر ماجراها به کندی می گذره. قسمت جالب کتاب سفر به گذشته ی جیمی بود. الان واقعاً معتقدم که آنتونی توی ژانر دلهره استاده. می تونه شما رو توی لحظه اسم کتاب توی ترجمه طلوع تاریکی انتخاب شده. شاید از یه لحاظی بشه گفت انتخاب درستی بوده. داستان در مورد دو نگهبان دیگه ی دوازه به اسم های جیمی و اسکات تایلره که حالا با برگشت پیشینیان در خطرن. اونا ردگیری شدن و متیو و پدرو از اونا هیچ اطلاعی ندارن. پس اونا باید به تنهایی از خودشون مراقبت کنن تا مت و پدرو و نکسوس خودشون رو وارد ماجرا کنن. اما برای این دو برادر ماجراها به کندی می گذره. قسمت جالب کتاب سفر به گذشته ی جیمی بود. الان واقعاً معتقدم که آنتونی توی ژانر دلهره استاده. می تونه شما رو توی لحظه مورد نظر بترسونه و وارد ماجراهایی کنه که اصلاً نتونین کتاب رو کنار بذارین. از طرفی توی این جلد از مجموعه آنتونی حیله ی دیگه ای رو به کار گرفت. اون به داستان جیمی و اسکات می پردازه در حالی که تاریخ داستان عقب تر از داستان قبلی کتابه. در واقع شما می دونین که در چند هفته ی بعد از ماجراهای جیمی و اسکات مت و پدرو کجا هستن و دارن چی کار می کنن. این عالیه که داستان ها از یه جایی شروع می شن تا به نقطه تقاطع برسن. گر چه به شخصه فک می کنم آخر کتاب رو آنتونی خیلی راحت سرهم بند آورد ( گر چه دلیلش منطقی بود اما بازم خیلی سریع بود. این کتاب منو سریع به سمت کتاب چهار برد. چون معمایی توش بود. قدرت اسکار چیه؟ و فصل آخر کتاب که در مورد اسکار بود هم شاهکار بود و خواننده رو واقعاً ترغیب می کنه که به سرعت به سمت جلد چهار بره. This is the third book in the Gatekeepers series. Scott and Jamie Tyler are identitcal twins, left on the side of the road in a box, with no parents and strange matching, thought to be, tattoos. They possess the power to read minds and control the actions of others.They learn later on that they are two of the Five Gatekeepers. Scott is captured by Nightrise, who have been searching for the Gatekeepers, but Jamie manages to escape with the help of soon to be friend, Alicia, who is in search of h This is the third book in the Gatekeepers series. Scott and Jamie Tyler are identitcal twins, left on the side of the road in a box, with no parents and strange matching, thought to be, tattoos. They possess the power to read minds and control the actions of others.They learn later on that they are two of the Five Gatekeepers. Scott is captured by Nightrise, who have been searching for the Gatekeepers, but Jamie manages to escape with the help of soon to be friend, Alicia, who is in search of her son Daniel. She thinks that Nightrise may have taken him. Jamie and Alicia journey to find Scott and free him from Nightrise. Their adventure takes them from Nevada to California, back to Nevada, again to Califorina, back to Nevada, and finally Scott and Jamie travel to Peru to meet Matt and Pedro. Along the way Jamie travels back in time and helps the original Gatekeepers in a battle against the Old Ones. Jamie then discovers who he truly is with help from the first Matt. This is the third book in the Power of Five series. I read the other two a while ago so had forgotten a fair bit, so this was almost a new story for me. Written for teens this is about five kids who all have to come together to save the world from the return of The Old Ones. Two of them have found each other in the previous two books and this one is about the 3rd and 4th. It is a good story although there is a strange jump in the middle where one of the characters wakes up in a completely differen This is the third book in the Power of Five series. I read the other two a while ago so had forgotten a fair bit, so this was almost a new story for me. It is a good story although there is a strange jump in the middle where one of the characters wakes up in a completely different world, and it took me a while to get that this was relevant to the story. There is also a little bit of repetition, where the author states something that he has already said before, as if he thinks the reader may have forgotten it, even though it was emphasized the first time. I liked the part of the story that was set in modern times, it had good pacing and characters. I have never read any Anthony Horowitz books before but now I am hooked. Even though this is the third in 'The Power of 5' series, I didn't feel confused about what was happening or worried that I hadn't read the previous books. Though I will definitely be checking them out the moment I get a chance. Jamie and Scott are telepathic twins. Ever since they were found, they have been able to read other people's minds, though they refuse to use this power except with each other. But when Scott is kidn I have never read any Anthony Horowitz books before but now I am hooked. Even though this is the third in 'The Power of 5' series, I didn't feel confused about what was happening or worried that I hadn't read the previous books. Though I will definitely be checking them out the moment I get a chance. Jamie and Scott are telepathic twins. Ever since they were found, they have been able to read other people's minds, though they refuse to use this power except with each other. But when Scott is kidnapped and Jamie is framed for murder, by Nightrise, everything changes. Not only does Jamie have to find his brother, but he has to deal with discovering that he is a lot more powerful than he realised - and that he is one of 'The 5' who will have to stop the old ones from rising. This is the third book in the gatekeepers series and I have to say my favorite thus far. Jamie and Scott are twins with the ability to read minds and make people do or see things. They try not to use their ability on other people because they have to delve into their minds and therefore only read each others minds. But when the Nightrise corporation, who are working to bring the Old Ones back, try to kidnap the boys, Jamie escapes. In his quest to find his brother he discovers he and his brother This is the third book in the gatekeepers series and I have to say my favorite thus far. Jamie and Scott are twins with the ability to read minds and make people do or see things. They try not to use their ability on other people because they have to delve into their minds and therefore only read each others minds. But when the Nightrise corporation, who are working to bring the Old Ones back, try to kidnap the boys, Jamie escapes. In his quest to find his brother he discovers he and his brother are two of the five gatekeepers and he most find Scott and find the others. More is revealed as to who the gatekeepers actually are and there is an exciting few chapters when Jamie is transported to the past to defeat the Old Ones. If the last couple of books are like this it will be a worthwhile series. This review has been hidden because it contains spoilers. To view it, click here. Night rise is a great book, it is especially good because it is in the middle of the series. In this book the two kids that are found gets in Russian jail and is forced to kill a immortal beast and finds another kid that can heal.